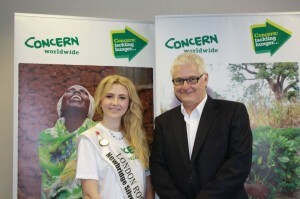 London Rose of Tralee, Grace Kenny whose roots are in Tullow, Co. Carlow, and a native of Crawley, West Sussex, took time out of her busy schedule to visit Concern Worldwide’s London office to give some encouragement to this year’s Concern London Triathalon relay team. 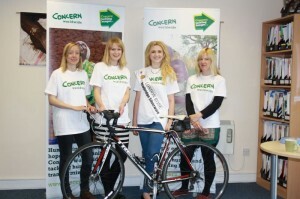 Photo L-R Natalie Jones (run), Carla Thompson (swim), London Rose Grace Kenny and Mila Robinson (cycle). The event, on 27th and 28th July at London ExCel, involves a 10km run, a 40km cycle and a 1.5km swim. All proceeds raised for Concern Worldwide will go to their education and nutrition programme in Liberia where it’s estimated over a third of children under five years old are stunted due to poor nutrition. Grace is one of three British Roses from London, Manchester and Liverpool who were among 23 young women selected at the Rose of Tralee Regional Festival last month. And with the 9 already pre-selected 32 go forward to the televised stages of the International Festival in the Dome with host Dáithí Ó Sé later this summer. Several corporate teams are competing on behalf of Concern Worldwide but, with only days before the deadline for registration, there are still places available. If you fancy taking part or would like to support the worthwhile project contact maria.mcdonnell@concern.net or ring 020 7801 1873. Concern Worldwide is an international humanitarian organisation dedicated to tackling hunger and transforming lives in the world’s poorest places. They are working for a world where no one dies for want of safe and nutritious food and use their expertise and local knowledge to help people and communities develop lasting solutions to hunger so that they can lead happier, healthier lives and lift themselves out of poverty. 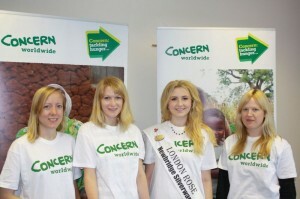 Visit their website on www.concern.net and find out how you can help them to help others.